Ah, that’s better. I’m back to a more normal level of work now. Even though it was a hectic month and a half, I actually had a lot of fun. I also probably ate more fast food in the past month than I’ve eaten in the previous 10 years. Now that things are settling down to a dull roar, I’m looking forward to real food. Well that and trying to get my life back in order over the weekend. My first stop was at the farmer’s market near the house. The produce is so much fresher than the produce in the store. That leads me to the latest local controversy. Apparently the Alabama Department of Agriculture visited some of the local farmers markets and decided the vendors had to use commercial quality scales instead of the much much cheaper scales designed for home use. The public outcry on that was so great, they changed their mind. A couple of years ago I bought an apple tree for the backyard. The first year, it had a couple of apples on it. The next year, it had none. But this year, it has a bunch of apples on it for its small size. Our rainy weather must be agreeing with it. I was doing some major grocery shopping the other day and on the way through the frozen food section, I noticed some frozen Indian meals from Amy’s Kitchen (Chris, they’re gluten free!). I love Indian food, so I grabbed one to try out. As luck would have it, I ended up at the checkout register with the Indian cashier. She was as excited as I was to see frozen Indian meals. It was pretty good for a frozen meal. I’ll buy more of them for those days when I don’t want to put much effort into eating. Several months ago, I read a good review of the vegetarian cookbook Love Soup. Now I’m not vegetarian at all but I don’t eat a lot of meat so I’ll buy good vegetarian cookbooks now and then. Several people mentioned in the comments that the author also wrote an excellent, older cookbook called The Vegetarian Epicure. I made a mental note to buy the book someday. (Have I mentioned my small collection of cookbooks?) Fast forward a couple of months, and I grab my favorite, very tattered vegetarian cookbook. I notice the title on the cover – The Vegetarian Epicure. Why yes, often I don’t notice the obvious. The ferrets have been crazy since I’ve been so busy. That means I end up with lots of pictures like this if they spot me with the camera. Congrats on the apple growing! I wish I had a pear tree loaded with fruit! And some strawberry plants, and blueberries. I need to go on a blackberry hunt this weekend. We should have plenty of those! Glad things are settling down for you a bit. Every now and then I decide I’d like to be a vegetarian, but I jus tknow I could never actually do it, but I do like to think about it. 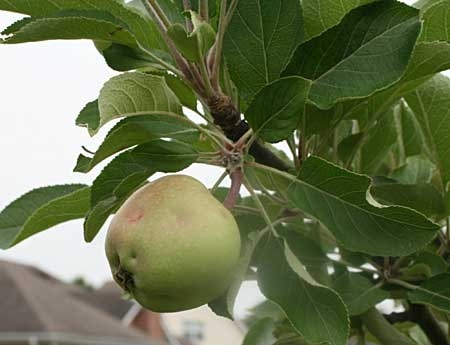 I”ve always wanted an apple tree, but my husband doesn’t like them for some reason. Oh well. Hope you and the ferrets get some quality down time. We’ve got an Amy’s Kitchen lasagna in the freezer! I’ll look for the Indian meals next time we’re at the grocery store (I was shocked to see Amy’s at all in our neck of the woods). I’m also adding the cook books to my wish list. Thanks for the tips! So glad work has eased up, and you can enjoy yourself a little more. I’d like to go vegetarian; I don’t eat most meat anyway, but haven’t given up the chicken yet. I should look into some of these cookbooks, so thank you for the suggestions. I think about going vegetarian. Then I decided there is probably a nutritional reason I crave meat from time to time. So I let my body decide what it wants – within reason. I wish our apple tree would put out fruit like that. Up until I was informed differently this year, I actually thought it was a flowering cherry. It does have teeny fruit, but closer to the size of marbles than real apples.